I inherited an old tea set that I believe belonged to my Granny who resided in Aberdeen. It has six large plates, six small plates, six teacups and saucers and sugar and cream jug. Can anyone assist me as to whether this is a valuable set that should be kept in the family or just a little bit of "rubbish" taking up valuable space. Peter (admin) says about "Grannies Tea Set S & C Bell China"
Bell China is a pottery mark of a Staffordshire pottery called Shore & Coggins of Longton. They traded from 1911 to 1966. Their other pottery marks included Queen Anne and Princess Anne China. As the dates show, there is a rarity and novelty value to Shore & Coggins wares (apart from having a fantastic sounding English name!). They didn't produce for that long and represent a kind of 'glory days' in UK Staffordshire potting where the market was so strong smaller family run firms could carve out a niche for themselves and hold off the giants. Of course, this has all changed with the giants all swallowing up the smaller firms in the latter part of the 20th Century and then themselves all going into administration in 2009. As it happens, thing are going full swing now with Portmeirion, a small family firm started in the 1960's recently buying out the giant names of Royal Worcester and Spode for a trifling £3million. To me (an enthusiast), you own a little piece of English history. I am not saying the wares of Shore & Coggins of Longton fetch a fortune because they don't. However, I have seen a single cup & saucer fetch £7. To sell you need to know how to list properly on ebay - take good looking photos and write the history/provenance of the wares and 'big-up' Shore & Coggins (at the bottom of this page you will see a banner link to a page where I explain more about this process). If a couple of Staffordshire collectors of S & G gets to see and like your set, you'll be quids in. Go to my China Replacement for further info about how to value your set and get a link to ebay. Orange and green spray very pretty. The cups are not round in shape - more hexagan. Does anyone have any other pieces? I have recently purchased a gorgeous cup, saucer and side plate set by the S&C company. It's dated 1947 and says "LINOGE" above the traditional 'superior, English Bone China, S&C England' stamp. I've searched and searched but can't find this reference anywhere! All I get is 'Limoges' in search results...Is this the pattern name? A nod to the French company? a one off? Can anyone help?! Linoge or Limoge would be the pattern - whether it's an 'n' or 'm' (could be a bad print - don't know without seeing it). As Peter says above, S & C is a "mark of a Staffordshire pottery called Shore & Coggins of Longton. They traded from 1911 to 1966. Their other pottery marks included Queen Anne and Princess Anne China".... as well as Bell china. Thank you elf...any ideas if they're collectable and what they're worth? It's definitely S&C Bell china, but I'm trying to price it and can't without knowing what this Linoge reference is... Any suggestions?! Cheers! S & C are a nice maker of bone china but are a (relatively) unimportant and short-lived maker, so values aren't that high for any pattern (Limoge/Linoge et al). They even had a pattern called 'Doris' ....ahhhh how cute is that? To give an idea, you can find a Shore & Coggins cup and saucer unsold on UK ebay for £3.99 GBP (UK). Or, on the other hand, some online US retailers are (rather optimistically in my view) asking $25 USD for an S & C cup and saucer. Elf, thank you! Just the info required. i have a tea service for five, including small plates, serving plate and cream and sugar. the pattern is 3951. my mother brought it with us when we left Scotland in 1948. can someone estimate it's worth? I've got a set of china with "superior" above a bell containing the words english bell china, which is above the names Shore & Coggins with Longton written underneath. It is gold rimmed/white clouds greenery and with "bluebirds" or maybe "swallows" flying, Can you please give me any info on this, as not sure what to do with it. Thanking you J Perry. I have 10 cups, saucers , side plates and one large cake plate. All in perfect condition. I would like to sell them,but have no idea of value. The design is a yellow buttercup pattern, with leaves painted on the inside of the top of the cup.Design Number 3041. I know they are at least 70 years old and I would like some information on how to date them. Looking for Bell China Tea Set or individual pieces. Pattern number 3471 design Geraniun,Yellow.Orange and Red. In a granny clean out we fell upn a S & C Bell china full tea set, pattern number 1820. Is anyone able to give me some info on it. It is available to be sold but have no idea of its value. Not seen in line so must be quite old. 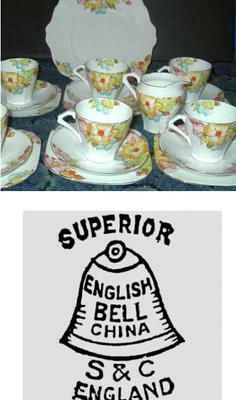 Hi, I have 6 cups, saucers & side plates made by Bell China number 4376 on the base of the cup. It's in a mint green and gold pattern. I can't find any pictures of the pattern online, lots of others. Anyone recollect seeing this anywhere or any ideas?